At least some teachers make it so by turning history class into a forced memorization of dates, names and places. So do parents. One of my closest friends refuses to visit a museum because, as a child (an only child), she was forced to endure day after day of museum visits during vacations. But history is much more than static displays. It’s the story of individuals told through their stories, their writings and their photos. Sometimes we are fascinated by what they tell us—and sometimes by what they do NOT tell us. A few weeks ago, I was volunteering at the Clare County Historical Museum and looking through the photographs in its files. A few caught my attention and I wanted to share them along with a few thoughts. Take the photo at left. What happened to the woman’s face at the upper right. Did a liquid accidentally fall on her (and only her) and did someone, in trying to remove it, ruin the photo or (as is more likely) was her face intentionally removed intentionally out of spite or hate. And if the latter, what did she do? 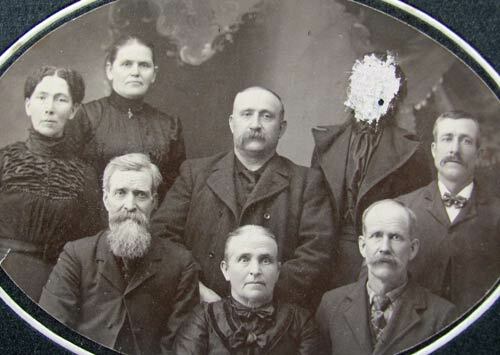 There are four men in the photo and four women in the photo. Was she the wife of one of the men and was she guilty some horrible crime or greatly embarrassed him or the owner of the photo. Maybe committing adultery? We may never know but the photo intrigues me. 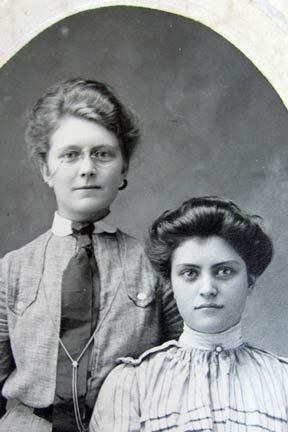 And then there is the photo of these two women. The one with the glasses and tie is attractive and has an air of authority about her. I see her as a manager of some type and proud of her role. Where did she work? And if she was a manager, did she only manage other women or men too? (Not sure if women in the 1890s were ever allowed to manage men.) Was she married? If so, when (and if) she had children did her work career come to an abrupt end and did she spend the rest of her days cooking and cleaning and raising children? Perhaps the other woman was her sister. Although well-dressed, she doesn’t have that professional “air” about her. Was she more conventional? And if the two were sisters, were they close? We may never know but the photo intrigues me. And here we have two boys. 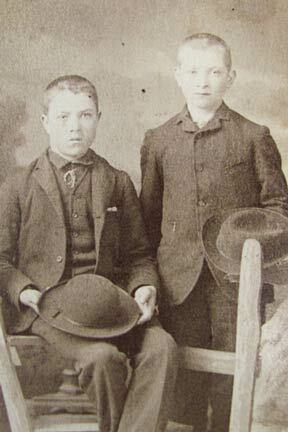 Brothers most likely, and maybe forced by their parents to get dressed up in their Sunday finest to have their photos taken. Maybe the first photos ever. Where they fidgety like many boys when it comes to photos? (And in those days one had to be verrrrry still during photos since shutter speeds were slow.) Were they the good boys they appear to be, or hellraisers? Once the photo was over did they tear off those (wool) clothes as fast as can be, or was dressing up natural to them? Who were they and what happened to them? We may never know but the photo intrigues me. Finally, we have this photo of this group of men all fixed up. Maybe they were lumberjacks just arrived in town from a logging camp and had money in their pockets, and stopped for a photo before they cut loose. 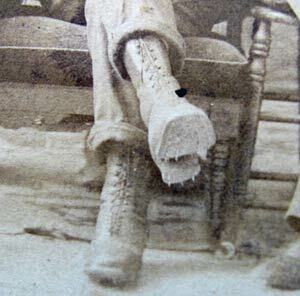 Maybe he wore the boots because they were the only footwear he owned. (One pities the woman who had to dance with him!) 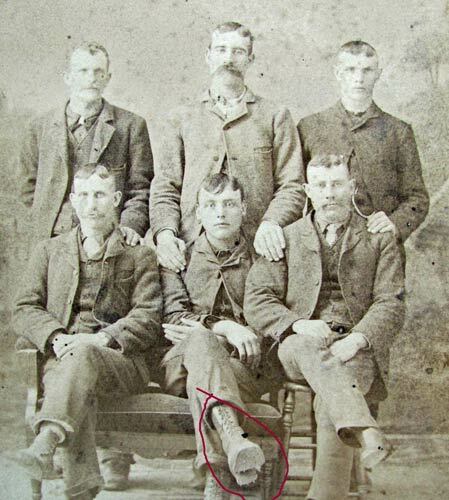 I figure after the photo the men left to hit the bars, gambling establishments and local “sporting” houses. How old were they at the time, and did they all survive to become old men? Doubtful as the life of a lumberjack was a hard and dangerous one. Maybe they got into a fight (a favorite occupation of lumbermen) that night and one of them never made it back to camp, ending up instead in a pine box in a long forgotten graveyard. Or they were on their way to church. We may never know but the photo intrigues me. And with photos like this telling stories and asking questions, history, at least to me, will never be boring.